When the first Garou howled the tales of their bravery into the night skies, it was begun. It was carefully preserved by the wisest Galliards throughout time, who added the stories of the greatest Garou. It has grown into more than a book, but into a collection of epics that preserves the history of the Garou Nation itself. It is the Silver Record. Two for the price of one! 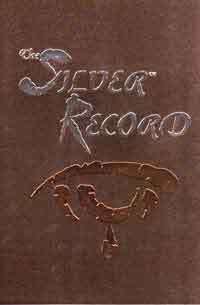 The Silver Record is a doubly valuable book for Storytellers and players alike. The first section provides excerpts from the original Silver Record, detailing the Garou past like never before. The second half is a glyph dictionary, useful for crafting props, sending messages or even designing Garou tattoos! This one is for everyone interested in werewolf lore.